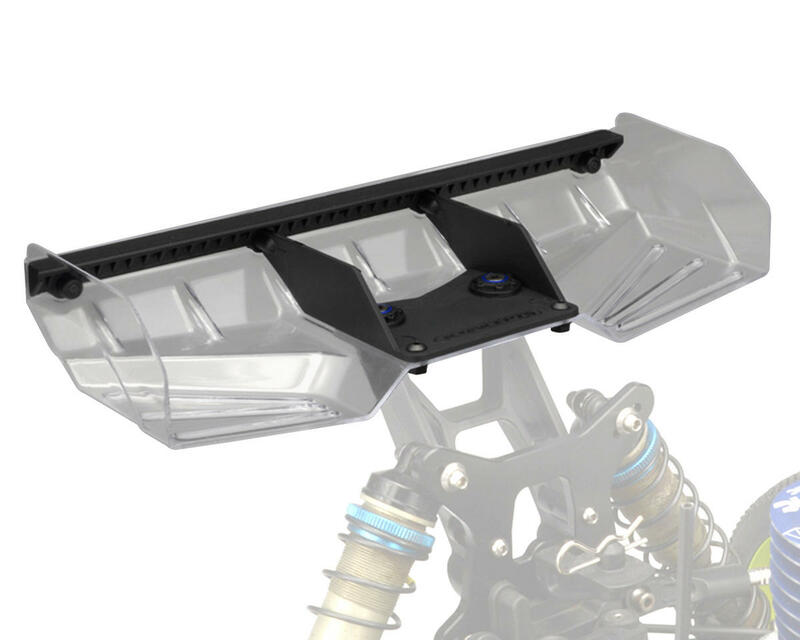 The JConcepts Hybrid 1/8 scale off road wing is a technically advanced alternative for 1/8th racing. The Hybrid wing features a design that incorporates a multi-height layout that allows the wing to sit in a lower stance. The side-dams feature a surface which has a recessed section that helps to increase rigidity. 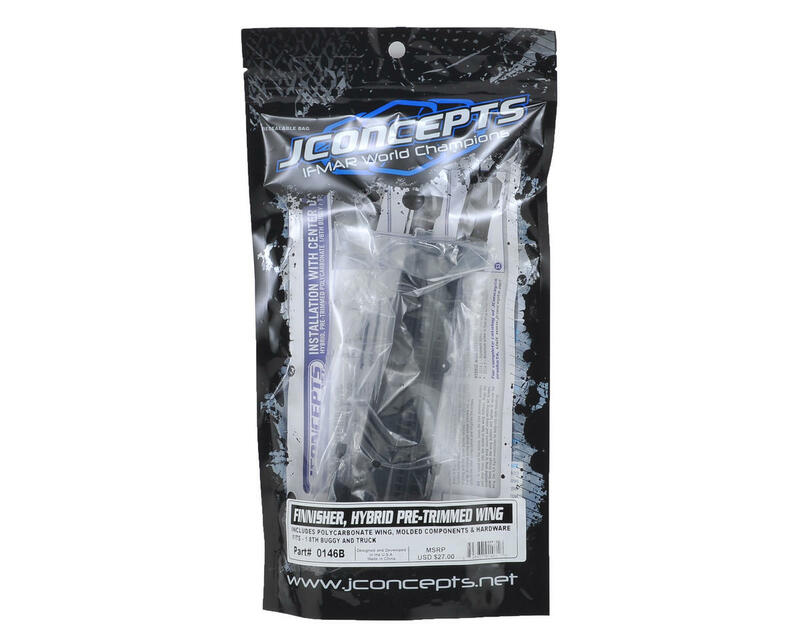 The pre-trimmed polycarbonate wing formed in heavy-duty material has a hard chamfered leading edge to the side-dams giving it a classic JConcepts look. Angular sections blend nicely into the high-performance shape giving a location for that initial step and transition to the wing’s gurney position. At the rear of the wing rests 7 individual ribs which support the wings upper section as it transitions to the gurney. The Hybrid sets itself apart with the inclusion of injection molded components that create the Hybrid structure. The center divider is utilizes locating holes that key it into position, and it bolts to the main section allowing the user to mark vehicle mounting position by simply looking through to the grid located on the bottom. Gurney options include 4 individual bars with a long and short overhang giving 2 options for wing configurations with or without the center divider. A rear gurney brace sits at the back of the wing beefing up the entire assembly. Attachment is simple using the included 3x10mm button head screws to clamp the unit together. Wing buttons are included with aluminum washer for screw down type builds while a body clip type mount can be used for other configurations. The wing set includes complete instruction for assembly, fitment information with notes and recommendations. 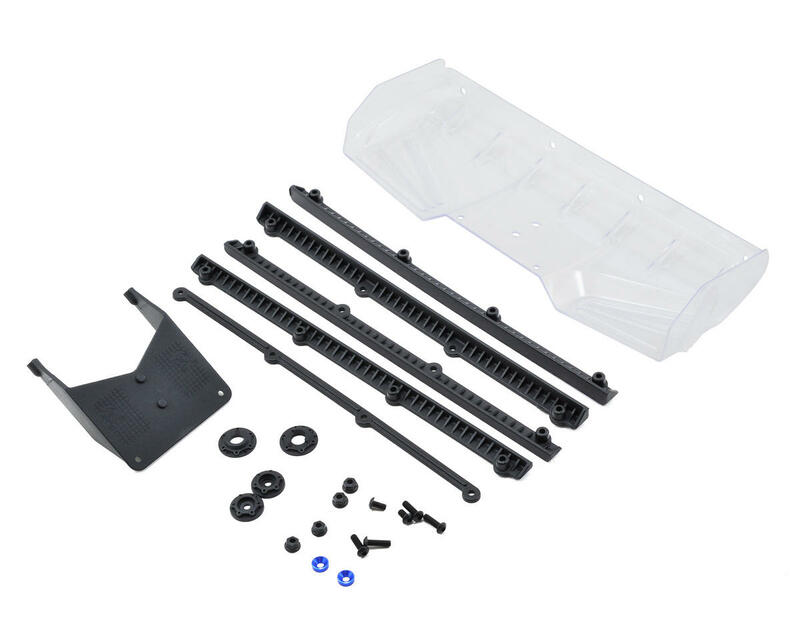 The Hybrid wing can be used with or without center divider for tuning purposes, however, using the center divider on the TLR 8ight buggy is not recommended.